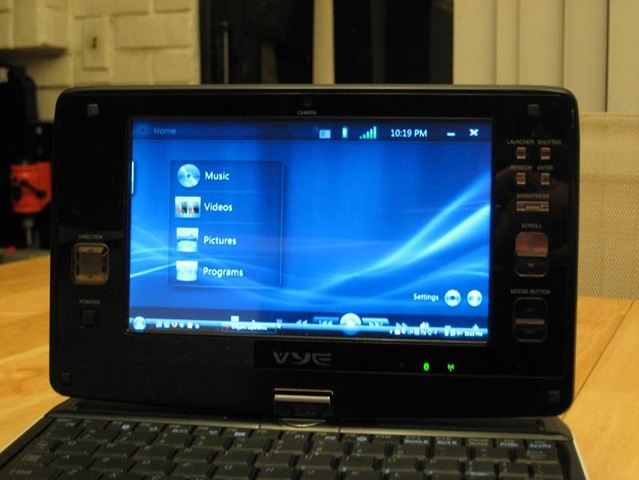 In previous posts, I’ve promised that I would continue my review of the Vye S37 with a discussion of music players. Although I started working on the post quite a while back, I’ve held off on completing and publishing as I realized that I really needed to spend more time using the various players. In this post, I am going to talk about Microsoft’s Windows Media variants: Windows Media Player 11, Origami Experience, and Windows Media Center. For many UMPC owners, I’m sure these are essentially the default choices for music playback. On my eo v7110, I pretty much exclusively used a combination of WMP and Origami Experience and they were the first players that I tried on my Vye as well. In time, I found them to fall short of many of my needs, though. I eventually tried a few other products and ended up selecting Media Monkey as my preferred music player. In the near future, I will write up a separate post entirely about that product. 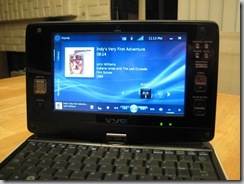 Finding the right music player for use on my Vye was essential as it is one of my key uses. I have a big CD collection that I have accumulated over many years and have put a lot of time and effort into ripping them all to digital copies. My wish to have my whole library on my UMPC was a major motivator in buying the Vye and upgrading it to a 250GB hard drive. Part of the reason for the large size of my collection is that only a fairly small percentage of it consists of typical 10 track or so pop albums. Instead, I have a very extensive collection of film scores and compilations as well as quite a bit of classical, Broadway and film musicals, and other similarly specialized music. In those genres, many of the CDs approach the 75 minute maximum and frequently have large numbers of fairly short tracks. My collection includes over 1,400 albums with over 26,000 separate tracks. When I first started the process of copying my CDs to digital files, hard disk space was a lot more expensive than it is now. In order to limit the space needed a bit, I stuck with MP3 files at 128 kbps. The sound quality on that isn’t bad, but certainly could be better. Now that you can get a terabyte of storage for not too much more than $200, I’ve been re-ripping the entire collection in the lossless, open-source FLAC format. Obviously, those files are still too big to be practical for the Vye. For the portable use, I have converted each of the FLAC files to 128kbps WMA files, which are roughly the same size as the old MP3 versions, but with a better sound quality. A music library this large does tend to be a bit of a challenge for most digital jukebox software. That is a lot of meta data to keep track of and I also need a user interface that doesn’t make it too overwhelmingly difficult to locate whatever particular music I am looking for at any given time. 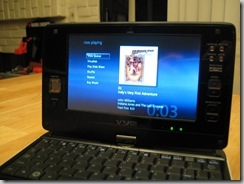 After the jump, I go into a more in-depth discussion of the 3 Windows Media based music players. 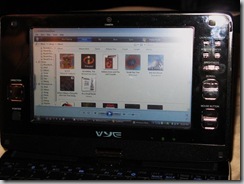 Windows Media Player, which is included with Windows, is not really a media player that is particularly well optimized for portable computers, much less those with relatively small touch screens. 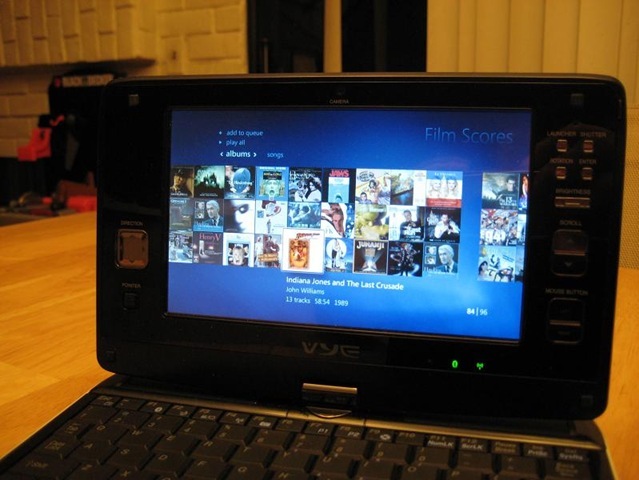 It is essentially a front-end for the underlying media management features of the operating system, though, meaning that it is likely to at least somewhat come into play on any system. Its underlying API is the heart of other Microsoft media players like Media Center and Origami Experience and even most third party music players at least make use of some features of WMP, particularly for playing protected content. The standard WMP interface is clearly not at all designed for, or friendly to, touch screen devices. The controls are almost without exception too small to manage effectively via touch and the displays often do not scale all that well to the 1024×600 display. It is useable, but far from being very friendly. My biggest issue with WMP (and its variants) is that it just doesn’t handle large libraries very well. With a small to moderate library, the performance is fairly snappy, but the more tracks that are added, the more it slows down. With a library as large as mine, it tends to be a bit sluggish even on fairly fast machines (like my Core 2 Duo, 4GB RAM desktop system) and it definitely has a hard time keeping up on a fairly slow system like the Vye. Another big problem that I have with Windows Media Player is apt to be an issue for many UMPC users, which is its inability to handle libraries that change frequently, particularly if some files previously in the library may end up no longer available. This has been an issue for me as I have been re-converting my library and regularly swapping out older versions of tracks, but it is also very likely to be an issue for anyone with a smaller hard drive that might want to keep music on a portable drive (or memory card) or generally rotate music in and out of their library. Microsoft has pretty much made the assumption that all library manipulation will be purely done inside of WMP and, thus, has little tolerance for dynamically changing libraries. There is no capability for re-scanning the library with any purpose other than simply adding new tracks. It can’t automatically remove tracks from the library that no longer exist on the hard drive, nor can it re-scan the meta tags on existing files to update their entries in the library. Even changing the tags on media within WMP doesn’t always write those tags back out to the file, preventing those changes from being seen elsewhere or if the library is re-generated. As noted at the beginning of this article, I have a long-term project going on to re-rip my library. That has also included a lot of re-working of the tags on existing tracks to get everything better organized. Most of this happens on my desktop system and is later synched to the Vye. With WMP, the only option is to go into my user directory, blow away the library file, and then re-scan the whole thing. This process typically takes a couple hours with such a large library. Even re-scanning to add new music that was ripped somewhere other than WMP (such as on a desktop system) can take a pretty long time. Despite some big limitations, I actually used Origami Experience pretty extensively as a primary music player on my eo v7110. 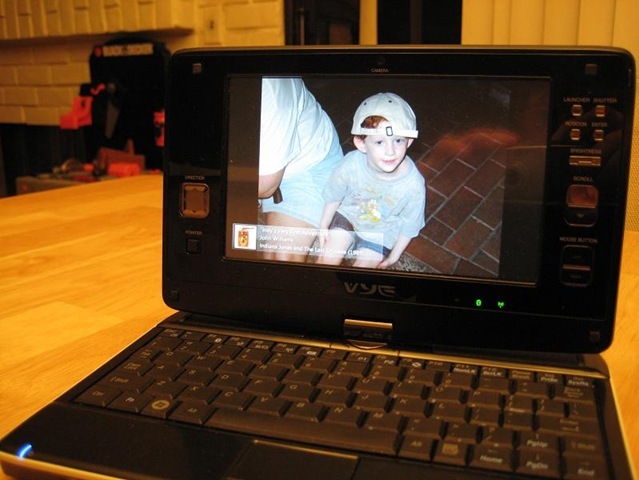 I was not entirely satisfied with the navigational performance or the flexibility of the user interface, but it did generally work better than most alternatives. 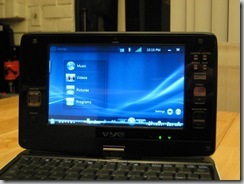 Under Vista, I found that the audio quality on the eo was generally best with Windows Media Player and its variants and the interface was much more useable on a 7-inch touch-screen than the stock WMP interface. Installing Origami Experience on the Vye turned out to be something of a challenge as Microsoft unwisely put restrictions on the installer designed to prevent people from installing the software on anything other than a UMPC. Unfortunately, these restrictions prevent it from being installed on a number of devices where it really should work, including the Vye. I’m not entirely certain, but I believe the 1024×600 resolution of the screen is what the installer believed to be outside of specifications. 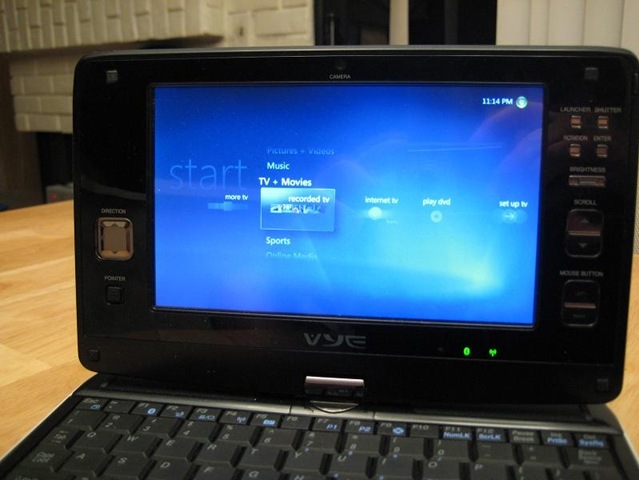 Fortunately, UMPC Portal published instructions for modifying the installer to remove those restrictions and following those directions easily allowed me to install the software on the Vye. I had two major complaints with Origami Experience on the eo and both still apply on the Vye as well. 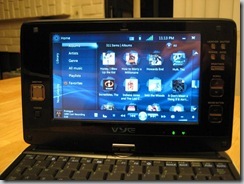 First of all, the user interface is very touch-friendly and generally looks good, but it isn’t particularly flexible. My biggest problem with the interface is that it really only allows single level navigation by either album, genre, title, or artist. With such a large library, it helps to be able to narrow the selection down further. To be specific, I have carefully organized all of my collection into a core set of genres, but Origami Experience doesn’t provide any way to drill down from genre to album or artist. Performance is an even bigger problem with Origami Experience and I was surprised that it really isn’t much better on the Vye than it was on the eo. It can take as long as 30-40 seconds to bring up the music library and allow selection of albums or tracks. This is obviously a reflection of the general performance issues surrounding Windows Media Player and large libraries, but it really seems to be a problem that is amplified quite a lot with Origami Experience. I used Origami Experience a lot on the eo mainly because there really wasn’t an alternative that was all that much better, but I really spent fairly little time using it on the Vye. On the faster, more powerful system, its limitations stand out more. I probably will give the upcoming version 2.0 a chance when it becomes available, but the first version just isn’t a great choice on the Vye. 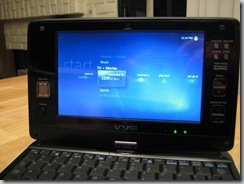 Vista Ultimate (as well as the Home Premium version that is usually included with the Vye) includes the Windows Media Center, another WMP front-end. While it is really intended for across-the-room use on a TV screen, it is also a pretty decent interface for a small touch-screen. In many ways, the interface is actually fairly similar to that of Origami Experience, although it is definitely more flexible and much more refined. The interface includes pretty extensive options for navigating through a large library, immediately making it much more useful for me than Origami Experience. When navigating by genre, drilling down further gives a list of all albums within that genre, which I previously noted was a serious shortcoming of Origami Experience for my use. Media Center gives pretty full access to the various commands available in Media Player, including the ability to edit tags or even delete items from the library or entirely from the hard drive. This makes it more of a complete alternate interface. As I noted, the interface is "decent" for touch-screen, but it isn’t ideally suited for it. The icons for selecting titles and menu items tend to be large, which works well. 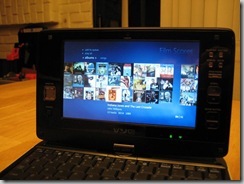 The "now playing" screen and other displays are full-screen with large print, which also works well on the small screen. On the other hand, scroll arrows and playback controls are all clearly designed for use with a remote control or mouse and tend to be pretty hard to use with touch. My favorite feature of Media Center is the slide-show feature. From the "now playing" screen, an option to start a slide-show is always available. The photos are then presented in full-screen, but you can keep the current track information (including album art) in the bottom left corner of the screen. Playback controls are also available at any time without having to interrupt the slide-show. While Origami Experience does offer a slide-show as well, it isn’t nearly as slick or easy to use. My only real complaint is that Windows Media Player doesn’t allow separate folders to be specified for music and photos, which means that I have to periodically manually purge album art images from the photo library. The big downside to Media Center is, once again, performance. On the eo, it performed so poorly that it was simply not usable. It does work considerably better on the Vye, but it still has a tendency to slow way down or even come to pretty much a full halt occasionally. Probably the worst problem is that it will sometimes simply become non-responsive after I start music playing. In these cases, the music will continue to play uninterrupted (and with no disruption in sound quality), but I will have no access to any controls for a period of time. This includes the volume control, which can be a particular issue when first starting music playing. After 30 seconds or so, it does eventually free up. Response times can also be pretty sluggish while navigating menus as well, particularly when first displaying a page of albums or songs. Album art is used as the primary means of presenting music choices, but it can often take quite a while for Media Center to load in and display all the artwork on a given page of items. This results in an initial display of a bunch of light blue boxes with the title printed in white text, but with the album art slowly popping up in replacement over time. This wouldn’t be so bad, but the system is pretty non-responsive while the art is loading. It doesn’t cache this well either as returning to the same list of albums/tracks later typically repeats the same process. I realize that I have a somewhat unusual situation due to the size of my music library. 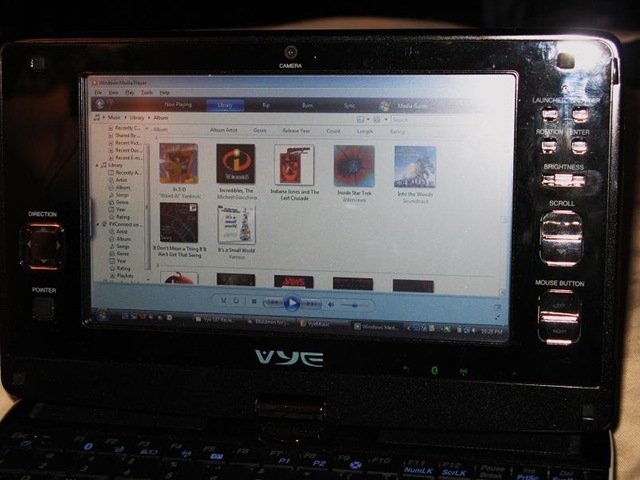 It is probably on the large side compared to the amount of music that most people manage on their desktop systems and it certainly is a very large library for using on a small device like a UMPC. Still, my library is what it is and it does result in substantially degraded usability for Windows Media Player based products. At this point, Media Center does have the best interface that I have yet found for a small touchscreen device like this and I also think that Origami Experience is an attractive and generally well-designed product as well. If it weren’t for the performance issues, I could easily see some combination of the two (with a probable nod towards Media Center) as my first choice for music playback. The performance issues and inability to manage a rather dynamic library have led me to seek out other options. As I said at the beginning of this post, Media Monkey has largely become my first choice as a music player, despite some definitely shortcomings on small-screen devices. In the hopefully near future, I will share my in-depth discussion of that product in another post. 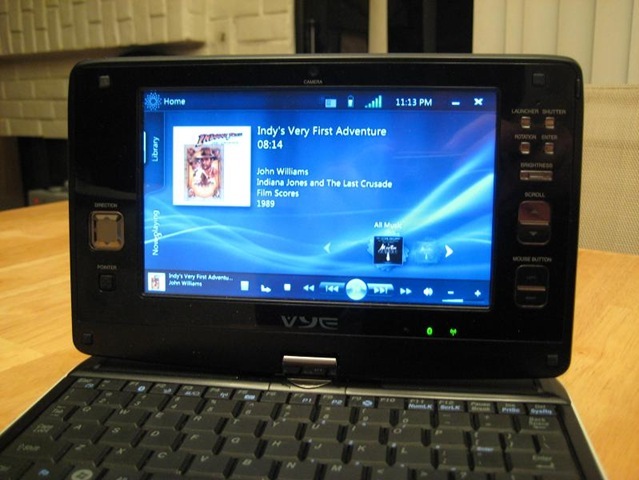 This entry was posted on Thursday, April 10th, 2008 at 10:41 pm	and is filed under Digital Music, Reviews, Software, UMPC, Vye. You can follow any responses to this entry through the RSS 2.0 feed. You can leave a response, or trackback from your own site.